It was time to replace the bathroom rug. How often do you do that? Really? I don't believe you. (wink, wink) I think you're a lot like me in that it gets replaced every other month, maybe. I sweep the floor but put the rug back. It's a rug. It's supposed to be heavy duty. I have 6 different bathroom rugs. Washing rugs is not a fun job. With cats in the house, the inside of the washing machine can get these balls of cat hair. Plus, my rugs are so old that the backing is coming off and I have to fish pieces of rubberized material out of the tub before the next wash. So, I usually wait to do a full load of bathroom rugs which means one needs to have more than a couple rugs to have a clean one. I learned to cross-stitch and embroider when I was 8. (I still have my first project. Some day, I should get it framed.) I learned to crochet when I was 13. But I didn't pick up latch hook until I was out of college. I had just wed and we needed a bathroom rug. In one of the many craft catalogs I received was the above kit. We liked the design and colors so we got it. I'd never done latch hook before. This was a lot of fun to do. The rug is approximately 35 years old. That's right, 35 years old. The rubberized backing has long been gone and when I brought this up from the basement, I finally ripped off rest of the edging material. 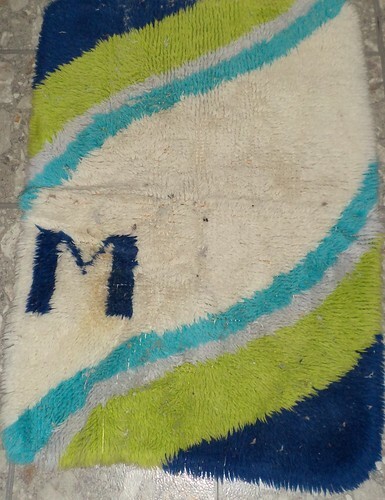 Compared to other rugs I have, this has worn extremely well. The backing kind of creaks when I unfolded it and dropped it on the floor. My friend, Meredith, said I should get those non-skid rug mats to put under my rugs. I think that would be a good idea for this. I haven't done a latch hook project in some time. They were seen as chintzy, as a fad, much in the same vein as macrame. I did that, too, for a time, but you can only make so many plant hangers before there's nothing left to make. Yet crafting, of any sort, really doesn't go "out of style". It can be adapted to new tastes and new styles. The explosion of Etsy and Pinterest Internet sites prove that crafty people can find buyers for their wares as well as inspiration for future crafts. I look at crafts and think, "I can make that". But, as we all know, just because we can make it doesn't mean we'll find the time to make it. 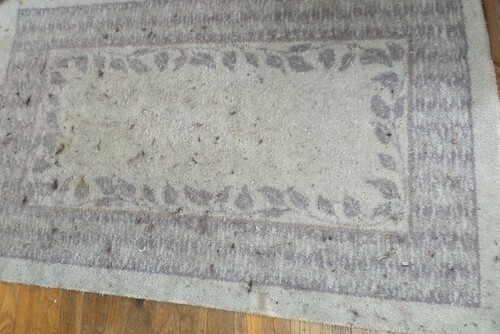 In the vein of rugs, here is a living room rug three weeks after a washing. It's cat hair that you see. We really haven't had the moisture to create copious amounts of mud in my back yard. It's quite interesting that, after a winter that took us .4 of an inch from the 2nd snowiest of all time, it melted slowly so there wasn't flooding and we've not had rain to speak of. I will give this a wash in a couple weeks to start May off with clean rugs. Pilchard has been attacking them so I know she likes them clean.